The Siege of Leningrad was one of the longest sieges in history and it inflicted some of the worst civilian casualties of World War Two. When Hitler declared his intention to obliterate the key city of Leningrad on 22 September 1941, he could not have foreseen the grim determination of its citizens. Over the course of 900 days, the city resisted the Germans pounding at its gates. Its survival contributed to the defeat of Nazism. But the price was heavy - over 1 million died in Leningrad from German bombs and artillery, or from disease, the cold or starvation. In its suffering Leningrad became a source of symbolic national pride, of good conquering evil. The story of the siege is one of heroic resistance and stoical survival but it also one of unimaginable suffering and extreme deprivation. 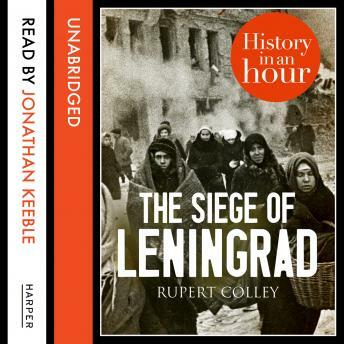 THE SIEGE OF LENINGRAD: HISTORY IN AN HOUR is essential reading for all history lovers. Know your stuff: read about the Siege of Leningrad in just one hour.